Privately-owned housing units authorized by building permits in May were at a seasonally adjusted annual rate of 1,138,000. This is 0.7 percent above the revised April rate of 1,130,000, but is 10.1 percent below the May 2015 estimate of 1,266,000. Privately-owned housing starts in May were at a seasonally adjusted annual rate of 1,164,000. This is 0.3 percent below the revised April estimate of 1,167,000, but is 9.5 percent above the May 2015 rate of 1,063,000. Privately-owned housing completions in May were at a seasonally adjusted annual rate of 988,000. This is 5.1 percent above the revised April estimate of 940,000, but is 3.5 percent below the May 2015 rate of 1,024,000. The 12-month rolling total of starts grew 11.8 percent year-over-year in May to 1,154,800 starts, slightly up from April. This represents the most starts in a 12-month period since August 2007. 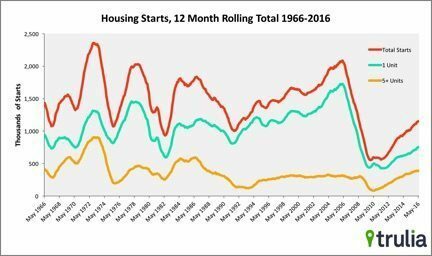 Housing starts continue to be a bright spot in an otherwise supply constrained market, and the 12-month rolling total inches up to 80 percent of the 50-year average of 1,443,060 starts. Is a housing bubble near? Will the drop in mortgage rates force the Fed to raise its rate? How much executive experience should the CEO of the country have?